Apple's online storefront was taken offline late Thursday as the company prepares to handle an expected onslaught of traffic when it takes iPhone XR preorders live a minute after midnight, Pacific time. 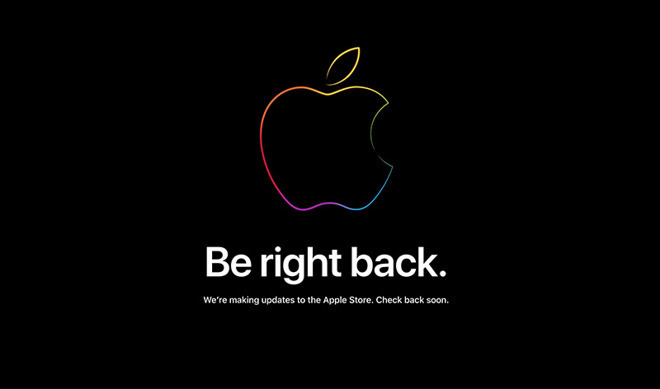 The online store went down at about 5:45 p.m. Pacific, with visitors greeted by Apple's new "Be Right Back" landing page that was introduced with iPhone XS orders last month. As usual, the site is expected to come back online on Friday at 12:01 a.m. Pacific, when preorders for the mid-range iPhone XR go live. Unveiled during September's special event, iPhone XR is this year's "more affordable" iPhone XS alternative. An interesting mix of new and old, the handset features a full-face 6.1-inch Liquid Retina Display, Apple's branding for an advanced LCD screen with rounded corners and support for tap to wake, wide color gamut and True Tone capabilities. In a notable feature exclusion, Apple is ditching 3D Touch in favor of a software-driven "Haptic Touch" solution that invokes additional options by simply holding on supported UI assets for an extended period of time. Like the flagship iPhone XS series, the XR is powered by Apple's new A12 Bionic processor. The chip integrates two high performance cores that are up to 15 percent faster than last year's A11 Bionic, and four efficiency cores that use up to 50 percent less power compared its predecessor. An in-house designed four-core GPU boosts performance by 50 percent. A full-face design does away with the Touch ID home button and instead relies on Apple's Face ID facial recognition technology. The 7-megapixel front-facing TrueDepth camera boasts an f/2.2 wide-angle lens and new video stabilization features for smooth 1080p video capture at up to 60 frames per second. Animoji and Memoji are also supported. On the rear, iPhone XR sports a single 12MP camera, the same wide-angle shooter included with the iPhone XS and XS Max. Thanks to the A12 Bionic's Neural Engine and new image signal processor, Apple was able to replicate Portrait mode and Portrait Lighting effects on the XR despite the absence of a second camera. The handset also supports Smart HDR and depth control adjustments that let users dynamically change a portrait photos' depth of field after the fact. Unlike its more expensive stablemates, the XR is crafted from aerospace-grade aluminum, not stainless steel. The material makes for a lighter overall product, while providing a suitable substrate for a variety of anodization options. Apple is offering the XR in white, black, blue, yellow, coral and (Product)Red finishes. The iPhone XR is priced at $749 for 64GB of storage, $799 for 128GB and $899 for 256GB.